Funeral in Berlin, the second Harry Saltzman-produced film based on Len Deighton’s spy novels and starring Michael Caine, is now available in a new DVD release in the U.S. through Warner Bros.’s Warner Archives. Saltzman, co-founder of Eon Productions, producer of the James Bond film series, had ambitions beyond the 007 movies. At the same time, Saltzman summoned 007 film veterans to work on his Deighton-based films. With 1966’s Funeral in Berlin, Saltzman hired Guy Hamilton, who helmed Goldfinger, as director. Also on board was Ken Adam as production designer and Peter Murton as art director. Other films in the series employed John Barry, Peter Hunt and Maurice Binder. Warner Archive specializes in “manufactured on demand” (or MOD); the DVDs are made as they’re ordered and the sets aren’t available in stores. Warner Bros. has used Warner Archive for home video releases of properties in the vast WB library, including THE GIRL FROM U.N.C.L.E. and THE FBI television series. The price for Funeral in Berlin is $18.95 plus shipping and handling. For more information on ordering, CLICK HERE. 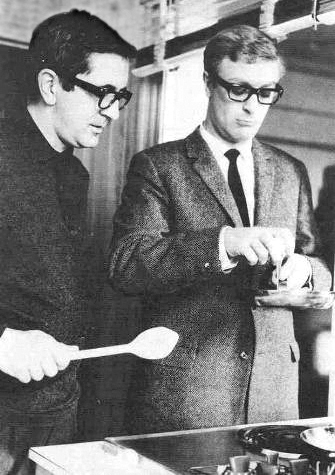 John Barry’s score for The Ipcress File is available for sale on the Web site of Screen Archives Entertainment. Barry was one of several crew members of James Bond movies hired by producer Harry Saltzman, Albert R. Broccoli’s partner in making the 007 films, to work on Ipcress. Others included production designer Ken Adam, art director Peter Murton and editor Peter Hunt. The 1965 film and its two sequels, Funeral in Berlin and Billion Dollar brain, were based on novels by Len Deighton, who also was involved for a time in scripting From Russia With Love. Michael Caine starred as Harry Palmer (whose character was unnamed in the books), a sort of anti-Bond. All three films in the series had some Bond crew members on them. Barry didn’t work on any other film in the series. You can CLICK HERE for more information or to order. The price is $15.95. The Cinema Retro Web site reports that Peter Murton, a veteran of the art department of early James Bond movies died in December. Murton was art director, working with production designer Ken Adam, on Goldfinger and Thunderball. He assumed the production designer role for The Man With the Golden Gun. His profile on imdb.com lists other signifcant credits, including art director (again working for Adam) on Dr. Strangelove.